Harry Rupel Harn was a millwright. "Harry is in Minneapolis" from Annie Sells letter, Feb 1910. 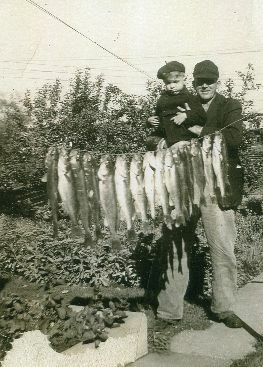 William O. HARN recalls Harry and Bertha visits in Minnesota. Obituary of Annie Harn Sells (20Nov1947), says Harry R. Harn in Chicago. There is a Harry Harn at 53 E. Bellevue Pl., in 1937 Chicago. Checking of Chicago City Directories, place Harry R. Harn at 53 Bellevue Plaza, as early as 1928 and up through the 1948 Directory. The 1928 Directory listed Harry R. Harn as a millwright, with wife Bertha. In the obituary for Oscar Harn in 1941, it states that Harry R. Harn is living in Chicago. Special Agent of the Bureau of Investigation took statements from Harry Harn regarding his Socialist leanings and not support the war effort. PLACE WHERE MADE: Chicago, Ill. In Re: Harry Harne[sic], 1255 N. Dearborn St. STATEMENT OF OPERATION. EVIDENCE COLLECTED. NAMES AND ADDRESSES OF PERSONS INTERVIEWED, PLACES VISITED, ETC. Subject appeared at the office of the Bureau on the invitation of operatives of the League and was interrogated by Agent. He stated that since March of this year he has been living at 1214 N. State St. He was born in Fairabault , Minnesota, forty-four years ago. Is registered for the draft at Local Board #46. Has been a member of the Socialist party for eight years and once a week delivers to subscribers The Chicago Socialist, a newspaper published in this City. He states that he is a millwright by trade and at the present time is working for the Washburn Crosby Co. at Deering, where he is superintending the installing of milling machinery at this plant. He is unmarried and has been living in Chicago for the past six years. He stated that he has not purchased any Liberty Bonds, but has about $300.00 on deposit in the Postal Savings Bank and his reason for not using any of this money for the purchase of Bonds is that he had a severe illness about three years ago, which cost him about $1200.00 and he wanted to have some ready money always on hand, as this illness cost him about $1200.00. In addition he claims to be supporting a nephew. He denied that he was opposed to the war or had any criticism of the Government, although he did state that as a Socialist, he was opposed to war in general. He further admitted that he was quite active in the Socialist party. PLACE WHERE MADE: BLOOMINGTON, ILL.
PERIOD FOR WHICH MADE: Dec 14. Arcola dated November 15, to the Department of Justice at Danville Illinois forwarded to Julius Rosin by U.S. Attorney Burnside, requesting investigation of this matter was sent to me by Special Agent Rosin of Springfield. I received also a communication directed to me presumably from Mr. Peiffer, dated November 27th, regarding this same matter. Having made investigations at Urbana and Champaign December 13th I went to Arcola from Champaign arriving at 1 A.M. Sunday morning. I immediately conferred with Mr. Peiffer early the morning of the 14th. Also with Mr. Lyons, attorney at Arcola and Mr. Quirk, banker. During my conference with Mr. Quirk at the bank near the Hotel where HARN rooms, attorney Lyons came to the Bank and informed me that “HARN is already going” meaning that he wasin an argument at the hotel with hotel guests and others at the hotel. This was 10 A.M. Going to the Hotel I listened to arguments between HARN and others continuously until 2 P.M. No stop for dinner. I then conferred with Mr. Peiffer and Mr. Quirk the banker and we concluded that HARN had not said enough at this time or perhaps at other times to convict him of any seditions utterances or other violations of law. The citizens of Arcola, Attorney Lyons, and others insisted that something be done to quiet HARN or get him out of Arcola as it has been already rumored that he would be tarred and feathered or some violence used against him if he remained longer. I conferred with Dr. Moser, Mayor of Arcola, and also with City Marshal G. M. Smith the latter having a son in the service in France, at this time, also a nephew still in the service and one nephew killed in the service. I arranged with the Mayor and the Police Officer to have HARN taken into the city hall where I might interview him in the presence of some of the city officials. I also conferred with his employer, J.N. Ernest who requested that if I do so to see that HARN left Arcola before anything serious occurred. I directed HARN to accompany me to the City Harn where upon our arrival about 3 P.M. a number of persons had assembled. The Mayor being there, three of the alderman, a few businessmen, City Marshall Smith, and about twenty Legion boys. More than Agent desired to be present but saw no way to prevent it. During the interview with HARN at the city hall he stated that he was forty-five years of age, Born Faribault Minnesota. Parents born in the United States. A single man. Two brothers, one a farmer in Iowa. The other in railroad service. HARN has been employed at Arcola by the Ernest Elevator Company placing machinery in the elevator for the firm of B.F. Gump & Co. Iron Contractors of Chicago. He has been in Arcola about five weeks. His pay is $1.25 per hour. During the investigation he stated that he had been receiving this rate of pay $10.00 per day during the last four years. He had talked at every opportunity since coming to the Hotel where he had staid all of the time at Arcola, on I.W.W. doctrines, praising the Soviet Government in Russia as the working man’s Government. During the argument at the Hotel from 10 A.M. to 2 P.M. where I heard him talk, he stated a number of times that he was an I.W.W also a Communist, and would like to get a passport to Russia. During the afternoon interview he said he would like to go to Russia because he would like to live under a working man’s Government and see how it worked. Making this statement there were a number of offers made to assist him in securing such passports. He stated further during the interview that notwithstanding the fact that he had been earning $10.00 a day for the last four years he had not purchased a single Liberty Bond or W.S.S. . Also with Mr. Lyons, attorney at Arcola and Mr. Quirk, banker. He stated further during the interview that notwithstanding the fact that he had been earning $10.00 [editor: War Savings Stamps] nor had he given one cent to any of the calls for was purposes, Red Corss [sic], Y.M.C.A., Knights of Columbus, Jewish Relief Fund, Salvation Army or any other matter whatever concerning the war. This admission from his brought violent protests against his remaining longer in Arcola. This taken into consideration with all of his I.W.W. propaganda which he had been spreading since he had been there, he having distributed a considerable amount of I.W.W. literature, generally among young men as I learned from the Hotel Proprietor, caused considerable feeling against him. I learned that the Hotel was anxious to have him leave. Hearing his admissions at the city hall, his employer Mr. Ernest requested that he leave Arcola, and immediately telephoned by long distance to Chicago directing that the company send another man to complete the installing of the elevator machinery. During the afternoon interview Mayor Moser put a motion to those present concerning the loyalty or disloyalty of HARN as a citizen. This immediately following his admissions that he had been receiving $10.00 a day for four years and had done absolutely nothing to help the Government during the War period and designated him as a Traitor to his country. The vote was unanimous that he was disloyal and a traitor to the country. Continuing a little further Mayor Moser put another motion as to whether it was safe for HARN to remain longer in Arcola. The Mayor, the alderman, business men, and everyone else including about twenty Legion Boys, voted that he was not safe in Arcola and should leave on the first train. HARN was indeed anxious to comply with this direction from the Mayor. I knew of no reason why he should not leave as he had not said enough to warrant an arrest and conviction in the Courts. Mayor Moser directed that City Marshall Smith take him into custody and see that no harm befell him while he secured his tools and effects at the Hotel and accompany him to the 5:30 P.M. Illinois Central Train as he said he desired to go to Chicago. Going after his tools he begged the officer to use every effort to see that he did not get beat up before he left Town. The Legion boys agreed to see to it that no harm befell him but gave him to understand before he left the City Hall that they would see to it that he left on the first train. The Train was three hours late. At the station there was a large crowd probably forty Legion boys to see HARN off. He purchased a ticket for Chicago and left Arcola at 8:30 P.M. Agent returned from Arcola to Champaign and Urbana on the same train. Arriving at Arcola I learned immediately that something must be done to avoid serious trouble or HARN and it would not have been proper for Agent to have left without something being done. The course followed appeared to be the best one under the circumstances as HARN in fact was driven from this town. It will have a very good influence upon others of his kind who may possible be lurking about in other cities in that territory. Arcola is a small city of about twenty four hundred inhabitants in Coles County Illinois. I also secured a copy of the “Everett Massacre” which the Department no doubt has received from other sources. [editor: “The Everett Massacre” (also known as Bloody Sunday) was an armed confrontation between local authorities and members of the Industrial Workers of the World (IWW) union. It took place in Everett, Washington on Sunday, November 5, 1916. [S1587] Harry Rupel Harn, death certificate 28681 (12 Jul 1949), Steven Harn Redman, 2633 N. 1600 E., Layton, Davis Co., UT. Hereinafter cited as Death Cert - Harry Harn. [S1683] "World War I Registration Card"; http://www.ancestry.com; unknown repository address, Source Citation: Registration Location: Cook County, Illinois; Roll: 1503827; Draft Board: 46. Ancestry.com. World War I Draft Registration Cards, 1917-1918 (database on-line). Provo, UT, USA: Ancestry.com Operations Inc, 2005. Original data: United States, Selective Service System. World War I Selective Service System Draft Registration Cards, 1917-1918. Washington, D.C.: National Archives and Records Administration. M1509, 4,582 rolls. Imaged from Family History Library microfilm.. Hereinafter cited as "World War I Registration Card." Collection Title: Investigative Reports of the Bureau of Investigation 1908-1922. Hereinafter cited as Investigative Case Files of the Bureau of Investigation 1908-1922. Source Citation: Year: 1940; Census Place: Chicago, Cook, Illinois; Roll: T627_1006; Page: 5B; Enumeration District: 103-2671. 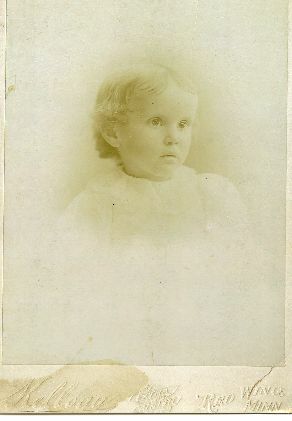 Gary B. Harn was born circa 1875 at Faribault, Rice Co., Minnesota.1 He was the son of Calvin Davis Harn and Rachel Ruple (Rupel). Unable to locate Gary in Rice Co, MN courthouse records. [S146] Unknown household, 1875 census, Faribault, Rice Co., Minnesota, census, Family History Library: 35 North West Temple St., Salt Lake City, Salt Lake Co., Utah. [S148] Waseca County, MN Marriage Records, unknown repository, unknown repository address. [S147] Hugh Valentine (Aubry) Harn entry, Birth - Hugh, unknown repository, unknown repository address. [S139] Waseca County-MN Marriage Record, Vol B-201, unknown repository, unknown repository address. [S1577] Herbert Elden Harn, Death Certificate 1931-MN-005502 (04 May 1931), Steven Harn Redman, 2633 N. 1600 E., Layton, Davis Co., UT. Hereinafter cited as Death Cert - H.E. Harn. HARN Family Bible. SOURCE: Marriage records, Rice Co., MN, certificate dated 22Oct1900. [S140] Rice Co MN Marriage Certificate, 22Oct1900, Rice County Courthouse, Faribault, Rice Co., Minnesota. 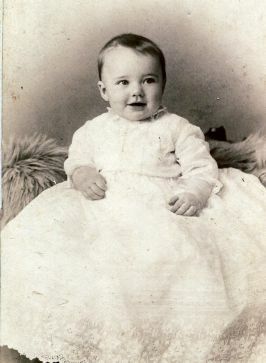 Hugh Valentine Harn at 6 months. 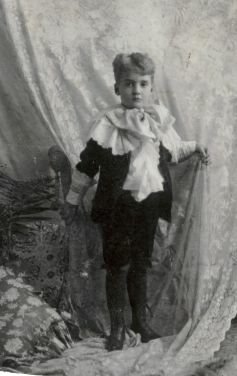 Hugh Valentine Harn at 5 years and 8 months, taken in Mason City, Iowa. Hugh Valentine (Aubry) Harn was a Attorney. He lived in 1907 at 122 Water, Mason City, Cerro Gordo Co., Iowa.4 He graduated in 1916 at University of Iowa, Iowa. He lived in April 1931 at 4221 Crocker Ave., Morningside, Hennepin Co., Minnesota.5 Hugh Valentine (Aubry) Harn was a Episcopalian. The following material was presented by Lew C. Church, in Memorium of Hugh Val Harn; and was located at the Hennepin County Bar Association in Minneapolis, MN. Hugh Val Harn was born at Winona, Minnesota, on February 14, 1891. Of Walsh and English ancestry, he was the son of Herbert and Alice Harn. His early education was obtained in the City of his birth, and in the grades and high schools at Mason City, Iowa. 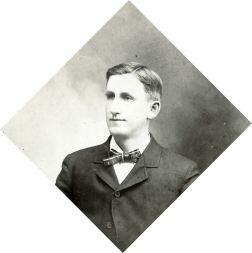 In 1912, after three years as a student at the University of Wisconsin, he entered the University of Iowa, and graduated from its law department in 1916. In the latter institution he had the distinction of election to the presidency of the senior law class. A clipping from a Mason City newspaper of that time refers to him as having been among the best as high school student, a leader at the University of Wisconsin, an outstanding personage in law school, and a young man of promise, highly regarded in the community. During vacations he had worked as a reporter on the Globe Gazette of Mason City, and enjoyed the esteem of his employer. Upon attaining the age of twenty-one he was admitted into the Masonic Lodge in that place, all officers participating in the ceremony being past masters. Mr. Harn was admitted to the Bar of Iowa in 1916, and at about the same time was made Secretary of the local Chamber of Commerce. On July 25, 1918 he enlisted for service in the World War, and served as a member of Iowa Company A, Third Regiment. At the time of his discharge he was a private at Headquarters Detachment, Camp Gordon, Georgia. There he taught marksmanship, having been given medals for his skill in that art while a member of the Mason City Guards. In 1923 Mr. Harn came to Minneapolis, was admitted to the Bar of this State, and was received into the real estate office of Nickels and Smith by the late Fred G. Smith. From that time, and nearly as long as he was able to be active, he was occupied both as a lawyer and in the real estate business in the Nickels and Smith office, where he had been elected one of the officers and directors of the corporation. He was a hard worker, and his law practice was largely an office practice of real property law. In religious faith he was an Episcopalian, having been baptized at Winona by Bishop Thurston. He united with a church of that denomination at Mason City, and was a communicant of St. Mark's Church in Minneapolis at the time of his decease. For quite a good many months before his passing, which occurred on May 16, 1937 at the United States Veterans Hospital near Fort Snelling, he was not at his best; and for some time was unable to go to his off at all. As a business friend the writer of this paper knew him well during most of the period of his residence in Minneapolis, and had many business contacts with him; and now looks back upon him as one of the most loyal of friends. [S149] Hugh Valentine (Aubry) Harn entry, birth, unknown repository, unknown repository address. [S150] Lew C. Church, "Bar Association memorial presentation", Hennepin Co , MN Bar Association memorial presentation (May 1937). Hereinafter cited as "Bar Association memorial presentation." Ancestry.com. U.S. City Directories, 1821-1989 (Beta) (database on-line0. Provo, UT, USA: Ancestry.com Operations, Inc., 2011. John C. Sells taken in Denver, Colorado. John Calhoun Sells was a Quartz Miner.2 His Social Security Number was 566-18-8818. The cause of death was Bronchopneumonia. Letter from J.C. Sells 7-1951, Lompoc, CA. The following obituary was from LOMPOC RECORD (CA) Newspaper 23 Sep 1954. John C. Sells, a pioneer in Lompoc's diatomaceous earth industry, passed away Thursday in the Lompoc hospital. Masonic funeral services were conducted from Starbuck chapel Monday afternoon. Mr. Sells, 86, was born in Grant, Va., on September 13, 1868. He came to Lompoc 36 years ago as an engineer for the Celite company. He continued his employment there when Johns-Manville took over the plant and since his retirement several years ago continued to reside in Lompoc. He was very active in Masonic organizations, being a member of Spearfish Lodge, F.&A.M., in South Dakota, a member of the Eastern Star in Lompoc, and a member of the Scottish Rite and Shrine in Deadwood, S.D. Mr. Sells is survived by a son, John K. Sells, of Santa Fe, New Mexico. Census 21 June 1900 Cripple Creek, Teller Co., Colorado, E.D. 126, sheet 23. Census 6 March 1920 Santa Barbara Co., California, E.D. 106, sheet 8. [S151] John Calhoun Sells, Death unknown number, unknown repository, unknown repository address. [S2291] Find a Grave Inc., Find a Grave, database and images (: accessed Mar 2014), John Calhoun Sells (1868-1954) gravestone photograph, memorial no. 17061634, Evergreen Cemetery, Lompoc, Santa Barbara Co., California, photograph © Lois, 2014. Source Citation: Year: 1940; Census Place: , Santa Barbara, California; Roll: T627_334; Page: 7B; Enumeration District: 42-55. Description:. Hereinafter cited as 1940 United States Federal Census. George Washington VanSickle was born circa 1866 at Michigan; Info from 1910 Federal Census in Colorado. He was born on 12 October 1866 at Lawton, Van Buren Co., Michigan. He married Margaretta Helen Harn, daughter of Calvin Davis Harn and Rachel Ruple (Rupel), on 6 February 1909 at Larimer Co., Colorado.1 George Washington VanSickle died on 12 July 1918 at Wellington, Larimer Co., Colorado, at age 51. He was buried at Highland Cemetery, Wellington, Larimer Co., Colorado; Plot: Blk 6, Sec 8, Site 7. Census April 1910 Wellington, Larimer Co., Colorado, List as 44 years old and born in Michigan. Enumerated only with his 2 month old son. [S145] Larimer Co , CO Marriage Record, Book 198, page 331, Family History Library:, 35 North West Temple St., Salt Lake City, Salt Lake Co., Utah. Hereinafter cited as Larimer Co , Colorado Marriage Record,. Census April 1930 Chicago, Cook Co., Illinois, lists Bertha Wilson being 54 years old at time of census, and 49 years old when first married. Original data: "Illinois Deaths and Stillbirths, 1916–1947." Index. 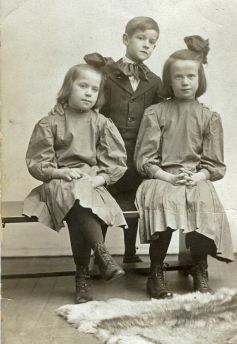 FamilySearch, Salt Lake City, Utah, 2010. Index entries derived from digital copies of original records. Jessie Andrew (Andy) Fiorella is the son of Andrew Joseph Fiorella and Jennie Salee. Jessie Andrew (Andy) Fiorella married Christine (?) Jessie Andrew (Andy) Fiorella married Nancy (?) Jessie Andrew (Andy) Fiorella married Donna Kaye Spilman, daughter of Donald Walter Spilman and Doris Alice Harn, on 22 January 1966 at St. John's Church, Kasson, Dodge Co., Minnesota.2 Jessie Andrew (Andy) Fiorella and Donna Kaye Spilman were divorced before 1986. Richard Frederick Tilbury is the son of Donald Elmer Tilbury and Joyce Frances Eberhart. Richard Frederick Tilbury married Doris Ann Spilman, daughter of Donald Walter Spilman and Doris Alice Harn, on 25 March 1967 at Mantorville, Dodge Co., Minnesota.2 Richard Frederick Tilbury and Doris Ann Spilman were divorced. Gary Thompson is the son of Jim Thompson and Marion Aarsvold. Gary Thompson married Betty Jane Spilman, daughter of Donald Walter Spilman and Doris Alice Harn, on 2 August 1969 at Christ the King Lutheran Church, Byron, Olmsted Co., Minnesota. Newton A. (Skip) Kennedy married Penelope M. (?) Newton A. (Skip) Kennedy was born on 2 January 1939.2 He was the son of Everett Kennedy and Elizabeth (?) Newton A. (Skip) Kennedy and Penelope M. (?) were divorced on 12 November 1970 at Hennepin Co., Minnesota. Newton A. (Skip) Kennedy married Jean Marie Spilman, daughter of Donald Walter Spilman and Doris Alice Harn, on 26 June 1971 at 1st Congregational Church, Mantorville, Dodge Co., Minnesota.1 Newton A. (Skip) Kennedy and Jean Marie Spilman were divorced in 1984. Newton A. (Skip) Kennedy was a Sales for company based in Ill. He lived at Illinois. Julie (Judy) Ann Jasinski is the daughter of Jerome David Jasinski and JoAnn Popelka. Julie (Judy) Ann Jasinski married Laurence Michael Harn, son of David Marshall Harn and Celia Marie Stasney, on 6 September 1975 at Faribault, Rice Co., Minnesota. Julie (Judy) Ann Jasinski and Laurence Michael Harn were divorced circa 2006 at Rice Co., Minnesota. [S153] Interview with Carole Ann (Harn) Bongers (15364 Cabot Ave., Faribault, MN 55021), by Steven Harn Redman. Steven Harn Redman (2633 N. 1600 E., Layton, Davis Co., UT). 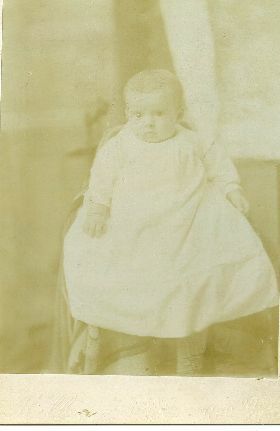 John Kenneth Sells age 9 1/2 months taken in Faribault, Minnesota. Col. John Kenneth Sells was a Military. California Passenger Ship list has John Kenneth Sells and Lewis Ellis Sells arriving in San Francisco on 07Apr1930 from Manila-Philippines on the ship US Grant. It lists Lewis born in Denver on 29Mar1902, John born in Cripple Creek-Colorado on24Sep1899.5 He lived in September 1930 at Fort Clark, Kinney Co., Texas, when daughter Ann was born. Birth Certificate for Ann, says father was 31 years old, born Colorado. Letter from J.C. Sells dated July 1951. He lived in 1955 at 325 E. Berger, Santa Fe, Santa Fe Co., New Mexico.6 The cause of death was metastatic carcinoma from undetermined primary site, severe Parkinsonism.2 His Social Security Number was 452-76-6104. John Kenneth Sells was born 24Sep1899/1900 in Colorado. The 1930 and 1936 editions have birth in 1899. The 1946, 1947, 1949 editions of The Army Registry have birth in 1900. His Army service record number was 014770. Graduated Calvary School, Basic Course in 1922, Regular Course 1937, and Command and General Staff School in 1940. He went through the ranks of Private, Private 1st Class, Corporal and Sergeant, Troop I, 5th Calvary, enlisted 12 Mar 1918 to 02 Apr 1919. As Private and Sergeant Troop I, 5th Calvary 03 April 1919 to 21 Aug 1921. Discharged as first lieutenant and appointed second lieutenant 15 Dec 1922, acts 30 Jun 1922 and 14 Sep 1922. Was in the Air Service from 01 Sep 23 to 20 Nov 1923. Promoted to first lieutenant on 18 Feb 1926; Captain on 01 Aug 1935; Major on 01 Jul 1940; Lt. Colonel on 03 Aug 1944; and Colonel on 11 Mar 1948. John K. Sells was awarded the Legion of Merit and Bronze Star Medal with Oak-leaf cluster. The Legion of Merit came into being about 1942, to be awarded for exceptionally meritorious conduct in the performance of outstanding services. The Bronze Star came into being about 1944, to be awarded for heroic or meritorious service. Generally an Oak-leaf cluster signified a second or subsequent award of the basic decoration. Obituary notice of Annie Harn Sells (20Nov1947), said that Colonel John K. Sells was stationed at Nashville, Tennessee. Obituary notice of John C. Sells (23Sep1954), said that John K. Sells was living at Santa Fe, New Mexico. The Hudspeth's Santa Fe City Directory for 1960, 1961, 1962, 1963, lists John K. Sells and wife, Lewis E., living at 325 E. Berger. There is no SELLS in the 1964 Hudspeth's Santa Fe City Directory. At 325 E. Berger, there lives an Edmund R. Delgado. There are no SELLS listed in the 1981-1985 Hudspeth's Santa Fe City Directory. The Department of Veterans Affairs (VA) lists the claim number for John K. Sells as #18177595, and date of death listed as 25 Nov 1975. Place of death was not available. Letter sent to the Veterans Affairs in Nov 1994 to obtain information from VA file, was returned in Feb 1995, by the National Personnel Records Center, St. Louis, MO. Form letter stated that "Under the provisions of the Privacy Act of 1974, we must have the written consent (signature) of the individual whose records are involved before considering your request." However, on the form, the Social Security number for John K. Sells was listed, 452-76-6104. The Social Security Death Index lists a John Sells, with a Social Security number of 452-76-6104 issued in Texas, born on 24Sep1900, died on Nov1975, with the usual place of residence listed as El Paso, Texas. John Kenneth Sells completed an Application for Social Security Account Number (SS-5), on 04Dec1962, when he was living at 319 E. Nevada St., El Paso, TX. Listed himself as unemployed, and born on 24Sep1900. Lewis Sells completed an Application for Social Security Account Number (SS-5), on 11Jul1962, when she was living at 325 E. Berger, Santa Fe, NM. She stated that her name given at birth was Hattie Lewis Ellis. Contacted the National Cemetery and Santa Fe Memorial Gardens Cemetery in Santa Fe, New Mexico. They had no reference of Sells. Research at the Santa Fe County Courthouse, was unable to find a related Sells female in the 1947-1966 marriage indexes. Research at the Santa Fe County Courthouse, found no Sells in the Probate Indexes. [S156] Col. John Kenneth Sells, unknown file number, Social Security Application for Account Number, unknown series (n.p. : n.pub.). [S2079] Col. John Kenneth Sells, death 89721 (11 Dec 1975), unknown repository, unknown repository address. Hereinafter cited as Death Certificate: John K. Sells. [S155] Col. John Kenneth Sells, Department of Veterans Affairs (VA), Claim Number 18177595 (n.p. : n.pub.). [S157] Letter from John Calhoun Sells (unknown author address) to unknown recipient, Jul 1951; Steven Harn Redman (2633 N. 1600 E., Layton, Davis Co., UT). [S1566] George Daniel VanSickle, unknown file number, SSDI - George VanSickle, unknown series (n.p. : n.pub.). Hereinafter cited as SSDI - George VanSickle. Census 1895 Red Wing, Goodhue Co., Minnesota, 1st Ward, sheet 474. [S1622] Edward Walter Perkins, death 1960-MN-030358 (08 Aug 1960), unknown repository, unknown repository address. Hereinafter cited as Death Certificate -Edward W. Perkins. 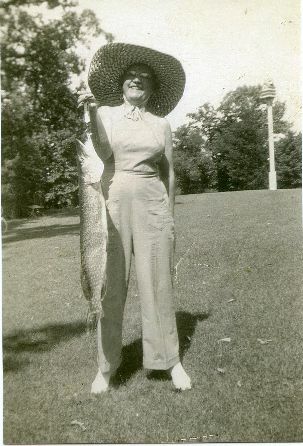 Nina Claire Perkins was a Housewife. Her married name was Carlson. Unable to find Nina in Goodhue Co. Death Records from 1960-1996. Obituary of husband, said they were married in LaCrosse, WI. Nina Claire Perkins was a Episcopal. There is a Marriage Record in Goodhue Co., MN, dated 24Feb1908, that has a Nina Claire Perkins and William Robert Gilley (of Dakota Co.) being married. Her married name was Adler. At time of death, residence was Wacouta twsp., Goodhue Co., MN. Her Social Security Number was 477-24-1029D, Social Security Death Index (b- 05Jul1889 d- Nov1974). Following from The Red Wing Republican Eagle 15Nov1974 (Friday) 7:4. Mrs. Carl (Edna) Adler, 85, former resident of Wacouta, died Thursday at St. John's Hospital. Born in Featherstone Township July 5, 1889, she was the daughter of Anna and Marshall Perkins. She is survived by three daughters, Mrs. George A. (Dorothy) Nelson of Red Wing, Mrs. William (Marian) Glawe of Largo, Fla., and Mrs. Victor (Virginia) Wren of Vancouver, Wash; three grandchildren and nine great-grandchildren; one brother, Lawrence Perkins of California; four sisters, Mrs. Marjorie Seiz of Red Wing, Mrs. Delta Harn of Rochester, Mrs. Nina Carlson of St. Paul and Mrs. Frances Davis of Red Wing. Private family services were held this morning at Bodelson Funeral Home with the Rev. Richard Hane officiating. [S162] SOURCE: Goodhue Co , MN, Marriage Records, Vol 19, page 125, Goodhue County Courthouse, Red Wing, Goodhue Co., Minnesota. [S163] Edna Earl Perkins entry, SOURCE: Goodhue Co , MN Death Record, Book 10, page 607 line 2, Goodhue County Courthouse, Red Wing, Goodhue Co., Minnesota. Frances Violette Perkins was a Milliner. Her married name was Davis. Milliner in St. Paul, MN 1910. Her Social Security Number was 476-78-8328 issued in Minnesota, Social Security Death Index (b- 12Apr1891 d- Nov1976). Following from The Red Wing Republican Eagle 9Nov1976 (Tuesday) 7:2. Francis V. Davis, 85, formerly of 417 1/2 W. Sixth St., died Monday afternoon at the Red Wing Nursing Home where she had been a patient for the past 2 1/2 years. Surviving are three sisters and one brother. Arrangements are with the Bodelson Funeral Home. [S165] Frances Violette Perkins entry, birth, Goodhue County Courthouse, Red Wing, Goodhue Co., Minnesota. [S164] Paul Bradley PURDY (321), A branch of the Purdy family descending from David and Eliza Ann Purdy with David's line from Francis Purdy of Fairfield 1595-1658, pg 10 (n.p. : n.pub., c1962). Hereinafter cited as The David Purdy Family. [S166] Frances Violette Perkins entry, SOURCE: Goodhue Co , MN Death Record, Book 11, page 104, line 2, Goodhue County Courthouse, Red Wing, Goodhue Co., Minnesota. Her married name was Seiz. SOURCE: Donald W. Johnson letter 1/1984. Death Record listed as "Ada Anna Seiz". Her Social Security Number was None. Following from the Red Wing Daily Republican newspaper, 5:2, 31Jul1913. Miss Ada Perkins and Thos. J. Seiz were married at a nuptial mass at St. Joseph's church at 6 o'clock this morning by Rev Father Carey. The bride was attended by Miss Christina Seiz and the groom by Albert Metzler. After the ceremony a wedding breakfast was served at the home of Mr. Seiz' parents, Mr. and Mrs. W.G. Seiz, 1012 Main street. The happy couple left on the 8:35 o'clock train for the Twin Cities and Duluth on their wedding trip. The bride is the daughter of M.T. Perkins of this city. Mr. Seiz is a conductor on the Great Western road. They will make their home in this city. Following from the Red Wing Daily Republican Eagle 24Jun1953, 5:3. The body of Mrs. T.J. Seiz, 59, lifelong Red Wing resident who resided at 1026 Main street, was found floating in the Red Wing bay this morning (Wednesday) Lambert Schafer when he reported for work as caretaker of the city dumping grounds. County Coroner Russell F. Edstrom was conducting an investigation today to determine the cause of death. He said that Mrs. Seiz either fell into the bay or leaped into the water from the dike leading to Bay Point. She was last seen alive Tuesday night at about 8 o'clock when her husband left the Seiz home for work. Her body was found shortly before 8 o'clock this morning about 30 feet from the caretaker's cabin on the city dumping grounds. The daughter of Mr. and Mrs. M.T. Perkins, Mrs. Seiz was born November 22, 1893, in Red Wing and had resided in this city all her life. She was married to T.J. Seiz July 31, 1913. She is survived, besides her husband, by one son, T. Robert Seiz of Red Wing; two daughters, Mrs. J.E. 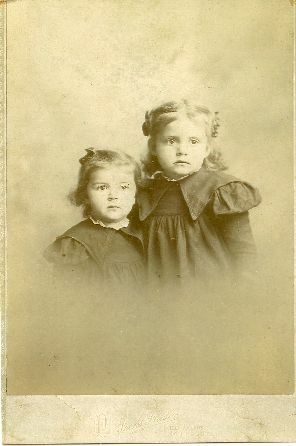 (Grace) Anderson, San Diego, Calif., and Mrs. L.F. (Frances) Graner, Mason City, Iowa; five sisters, Mrs. W.B. Davis, Milwaukee, Wis; Mrs. C.J. Johnson, Mrs. G.E. Carlson and Mrs. Carl Adler, all of Red Wing, and Mrs. Delta Coleen [sic], Faribault; two brothers, Ed Perkins, St. Paul, and Lawrence Perkins, Los Angeles, Calif., and seven grandchildren. Funeral services will be conducted at the Ferrin mortuary Friday at 2 p.m. Friends may call at Ferrin's Thursday afternoon and in the evening up until 9 o'clock. Following from the Red Wing Daily Republican Eagle 26Jun1953 (Friday) 5:2. Funeral services for Mrs. T.J. Seiz, lifelong resident of the city whose body was found floating in the Red Wing bay Wednesday morning, will be held at 9 a.m. Saturday at St. Joseph's Catholic church with Rev. Derham Ryan officiating. Internment will be in Calvary cemetery. [S167] Ada Amanda Perkins entry, birth, Goodhue County Courthouse, Red Wing, Goodhue Co., Minnesota. [S169] Ada Amanda Perkins entry, SOURCE: Goodhue Co , MN Death Record, Book 8, page 456, line 7, Goodhue County Courthouse, Red Wing, Goodhue Co., Minnesota. [S168] Unknown article title, OBITUARY: Red Wing Daily Republican Eagle, 26Jun1953, 5:2, Red Wing, Minnesota, 26 Jun 1953, 5. Hereinafter cited as RWDRE. Her married name was Johnson. As of 9 August 1955,her married name was Seiz. Her Social Security Number was 477-01-2839, Social Security Death Index (d- 24Sep1983, Red Wing). Following from The Red Wing Republican Eagle 26 Sep1983 (Monday) 8:2. Marjorie M. Seiz, 88, 611 Bush St., died Saturday morning at St. Mary's Hospital in Rochester where she had been a patient since Wednesday. 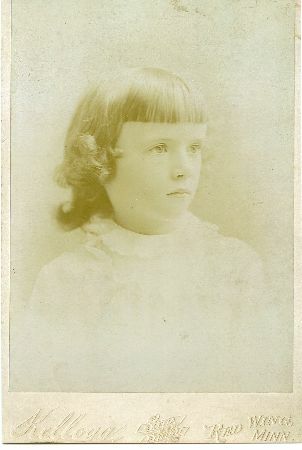 Born June 4, 1885, in Featherstone Township, she was the daughter of Marshall T. and Anna Perkins. She attended schools in Red Wing. She married Clarence G. "Casey" Johnson in 1913 and the couple lived in St. Paul. He preceded her in death on Dec. 15, 1950, and she moved back to Red Wing in 1952. She had worked at the Emporium Department Store in St. Paul. She married Thomas Seiz and he preceded her in death in 1968. Surviving are one son, Donald W. Johnson, Red Wing; three grand-children; six great-grandchildren, six great-grandchildren. Her two husbands, five sisters and two brothers preceded her in death. Funeral will be at 1:30 p.m. Wednesday at Bedelson Funeral Home with Rev. Donald Roberts officiating. Burial will be in Oakwood Cemetery. [S171] Marjorie Maude Perkins entry, birth, Goodhue County Courthouse, Red Wing, Goodhue Co., Minnesota. [S172] Marjorie Maude Perkins entry, SOURCE: Goodhue Co , MN Death Record, Book 11, page 569, no 1, Goodhue County Courthouse, Red Wing, Goodhue Co., Minnesota. [S173] Unknown article title, OBITUARY: Red Wing Republican Eagle, 26Sep1983 (Mon) 8:2, Red Wing, Minnesota, 26 Sep 1983, 8. Hereinafter cited as RWRE. The cause of death was croup. Following from The Red Wing Daily Republican Newspaper, page 5 column 1, 26Mar1898 (Saturday). The eight month old son of Mr. and Mrs. M.T. Perkins died this morning of croup. The funeral services will be held at the home on Monday afternoon, at 1:30 o'clock, Rev. W.C. Rice officiating. [S174] Marshall H. Perkins entry, birth, Goodhue County Courthouse, Red Wing, Goodhue Co., Minnesota. [S175] Marshall H. Perkins entry, SOURCE: Goodhue Co , MN Death Records, Book 3, page 254, line 4, Goodhue County Courthouse, Red Wing, Goodhue Co., Minnesota. [S177] Marshall H. Perkins cemetery marker; unknown reader. [S176] Unknown article title, OBITUARY: Red Wing Daily Republican, 26Mar1898, 5:1, Red Wing, Minnesota, 5. Hereinafter cited as RWDR. Doris Merle Perkins was born bt 18 Jun 1897/1900; Unable to locate Goodhue County Birth Record for Doris. She was the daughter of Marshall Timothy Perkins and Anna Rolfe Purdy. 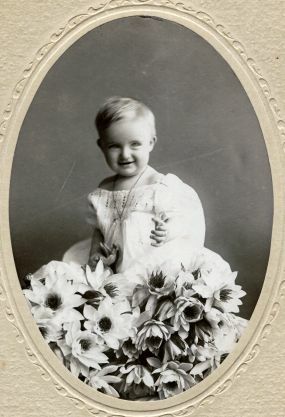 Doris Merle Perkins married Louis Frank Van Deusen, son of Murray Samuel Vandeusen and Lena Miller, in 1922. Doris Merle Perkins died on 10 November 1946 at Rochester, Olmsted Co., Minnesota; Death Record stated Doris was born 18Jun1901 in Red Wing, and that her and husband, Louis VanDeusen resided in Red Wing.3 She was buried at St. Johns Cemetery, Red Wing, Goodhue Co., Minnesota. Her married name was Van Deusen. Death Record for husband Louis, had surname as VanDeusen. [S179] Doris Merle Perkins entry, SOURCE: Goodhue Co , MN Death Record, Book 8, page 53, line 4, Goodhue County Courthouse, Red Wing, Goodhue Co., Minnesota. Larry and Dot Perkins on their wedding. Lawrence Rolfe Perkins was a Truck driver for a bakery. In 1920 Census, Lawrence was listed as stock clerk in a bookstore. The following obituary was from THE BEND BULLETIN (Oregon), 19 Dec 1988, page C-6. Lawrence R. Perkins a resident of Camp Sherman for the past 12 years, died Saturday at St. Charles Medical Center. He was 86. No services will be held. 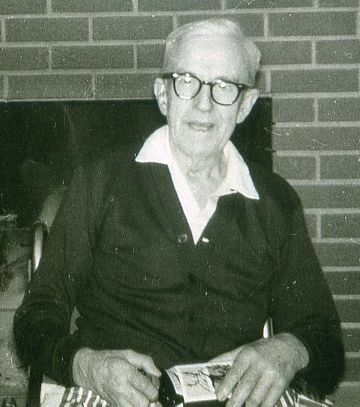 Mr. Perkins was born July 5, 1902 in Redwing (sic) Minn. to Marshall and Anna (Rolf) Perkins. Until his retirement he had been a truck driver for a bakery. He is survived by a daughter, Donna Deignan of Camp Sherman, a son, Lawrence Perkins of Norwalk, Calif, 10 grandchildren and 11 great-grandchildren. He was a member of the Baker's Union and the Teamsters. Tabor's Desert Hills Mortuary is in charge of arrangements. Census 1920 St. Paul, Ramsey Co., Minnesota, E.D. 74, Sheet 4. [S180] Lawrence Rolfe Perkins entry, birth, Goodhue County Courthouse, Red Wing, Goodhue Co., Minnesota. [S181] Lawrence Rolfe Perkins, unknown file number, Social Security Death Index (b- 05Jul1902 d- 17Dec1988 OR), unknown series (n.p. : n.pub.). Hereinafter cited as SSDI. [S183] girl Perkins entry, birth, Goodhue County Courthouse, Red Wing, Goodhue Co., Minnesota. Amelia Roselie Knutson was a Homemaker. Her married name was Perkins. Death Certificate for Edward W Perkins, listed name of his former spouse as Rosalie Knutson. Amelia Roselie Knutson was a Lutheran. George Emil Carlson was a Railroad Engineer. He lived in 1959 at Red Wing, Goodhue Co., Minnesota. The cause of death was Diabetes. In 1913 when Lawrence was born, George was a Fireman. Many references refer to him as "G. Emil Carlson". In Death Record, parents listed as Gust Carlson and Anna Bennett. In 1941, George was a pallbearer for Oscar Harn. His Social Security Number was 708-10-0868. Following from The Red Wing Daily Republican Eagle 8Sep1969 (Monday) 5:3. George E. Carlson, 86, of 1511 W. Third S., Red Wing, died this morning at St. John's Hospital where he was a patient since Wednesday. 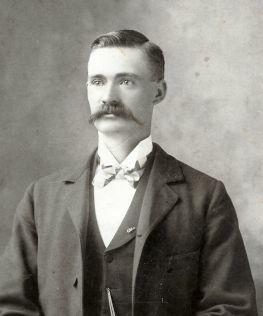 Born in Red Wing April 11, 1883, he was the son of Anna and Gust Carlson. He attended schools and lived in Red Wing his entire lifetime. He has been employed with Chicago Great Western railroad for 60 years, retiring in 11957 as a locomotive engineer. He was a member of Christ Episcopal Church and Red Wing Masonic Lodge 8, AF and AM. His marriage to Nina C. Perkins took place at LaCrosse. Surviving are his wife, Nina, of Minneapolis; two sons, Robert G. Carlson of Austin and Bert Carlson of Yankton, S.D; five grandchildren and four great grandchildren; two sisters, Mrs. Selma Grimm and Mrs. Esther Higbee, both of Red Wing. Funeral services will be Wednesday at 3 p.m. at Bodelson Funeral Home with the Rev. Nor C. Schoenheider officiating. Internment will be at Oakwood cemetery. [S184] Paul Bradley PURDY (321), A branch of the Purdy family descending from David and Eliza Ann Purdy with David's line from Francis Purdy of Fairfield 1595-1658, pg 9 (n.p. : n.pub., c1962). Hereinafter cited as The David Purdy Family. [S185] George Emil Carlson entry, SOURCE: Goodhue Co , MN Death Record, Book 10, page 250 line 2, Goodhue County Courthouse, Red Wing, Goodhue Co., Minnesota. [S186] Unknown article title, OBITUARY: Red Wing Daily Republican Eagle, 8Sep1969 (Mon) 5:3, Red Wing, Minnesota, 08 Sep 1969, 5. Hereinafter cited as RWDRE. He lived in 1959 at Red Wing, Goodhue Co., Minnesota. His Social Security Number was 477-24-1030. Social Security Death Index (b- 24May1888 d- Jun1968 Red Wing, MN). Social Security number was issued in Minnesota. In 1913 when Dorothy was born, Carl was a Clerk. Death Record of Edna, said spouse was Carl H.F. Adler. Following from The Red Wing Daily Republican Eagle 17Jun1968 (Monday) pg 11. Carl H. Adler, 80, of 438 1/2 W. Third St., Red Wing, died a St. John's Hospital Sunday morning after a brief illness. Surviving are his wife Edna; three daughters, Mrs. Marian Glawe of Tampa, Fla., Mrs. Virginia Wren of Vancouver, Wash., and Mrs. Dorothy Nelson of Red Wing; three sisters, Mrs. Louise Jorgensen, Mrs. Elsie Larson, and Mrs. Verna Sundberg, all of Red Wing; and four brothers, Fred and Herbert Adler of St. Paul, Milton of Los Angeles, and Richard of Red Wing. Cremation will be held at Forest Lawn Memorial Park, St. Paul. A. Swanson Son's Funeral Chapel, Red Wing, is in charge of arrangements. [S187] Carl Henry Adler entry, SOURCE: Goodhue Co , MN Death Record, Book 10, page 171, line 2, Goodhue County Courthouse, Red Wing, Goodhue Co., Minnesota. Death Record said residence was Central Point Twsp., Goodhue Co. His Social Security Number was 346-07-4839. Following from the Red Wing Daily Republican Eagle newspaper, page 3, column 6, 23Oct1953 (Friday). William B. Davis, Lake City, formerly of Milwaukee, died suddenly Wednesday night following a heart attack. He and Mrs. Davis had moved here about three months ago. He was born July 11, 1883, at Portchester, N.Y. Mrs. Davis survives. The remains were taken to the Twin Cities for cremation. He was a member of the Masonic order. [S188] Unknown article title, OBITUARY: Red Wing Daily Republican Eagle, 23Oct1953, 7:6, Red Wing, Minnesota, 23 Oct 1953, 7. Hereinafter cited as RWDRE. [S189] William Bernard Davis entry, SOURCE: Goodhue Co , MN Death Record, Book 8, page 475, no 6, Goodhue County Courthouse, Red Wing, Goodhue Co., Minnesota.